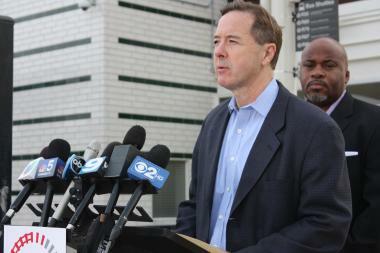 CTA President Forrest Claypool originally said the O'Hare surcharge would mainly affect tourists. CHICAGO — Suddenly, almost everyone, including tourists and residents alike, will be paying the same higher rate at the CTA's O'Hare Blue Line stop. A surcharge making it $5 for all riders boarding the Chicago Transit Authority at O'Hare International Airport fully kicked in Monday. O'Hare employees, those with a Chicago Card Plus on a monthly payment plan and those with unlimited-ride short-term passes will continue to pay $2.25, but all others — tourist or longtime city resident — pay the full $5. CTA President Forrest Claypool originally said the surcharge would mainly affect tourists when it was announced late last year as part of budget-balancing measures. Chicago Card and Chicago Card Plus holders were being charged the normal $2.25 rail fee at O'Hare for the first six months of the year, after the surcharge took effect in January, while the CTA worked out details on a new smart card for O'Hare employees with the Chicago Department of Aviation. But now Chicago Card holders will be subject to the $5 fee, and the only way for Chicago Card Plus holders to avoid the surcharge is by replenishing on a 30-day plan. And riders using those plans are also paying more, with the 30-day pass jumping to $100, up from $86 earlier this year. The same sort of fare structure will be imposed on Ventra cards as they're phased in later this year and into 2014. Those with unlimited-ride passes for 1-, 3-, 7- and 30-day periods will also be charged $2.25, although it's really a moot point with unlimited rides. Those with the basic CTA strip cards — such as ones bought at CTA stations — have been paying the surcharge since January. Monday's new increase will generate another $4 million this year, according to the CTA. About 10,000 passengers board the CTA at O'Hare every weekday.